Picking up a copy of Pokemon Soul Silver has been on my To Do List for quite some time (because I totally have one). The price however hasn’t really budged since its release nearly 4 years ago. The price; ranging from £36 used to £110 new on Amazon, coupled with the fact that I still have Diamond and White to finish, meant that I haven’t felt justified in spending the money on it. But after a particularly expensive and bad day last week (my first fillings), I decided to treat myself. I was able to pick up a copy at a CEX store for just £30, far cheaper than what Amazon or ebay could offer me. With the excitement of a brand new Pokemon adventure laid out in front of me, I decided I wasn’t going to play it the way I’ve always played Pokemon. Any Pokemon that faints is considered dead and will be released. I may only catch the first Pokemon encountered in a new area. If I white out, game over. All Pokemon will be nicknamed. 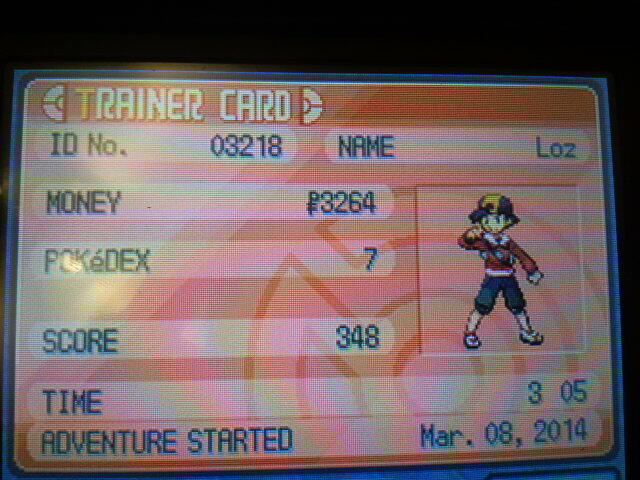 Starting Pokemon will be decided on the last digit of my trainer ID (1-3 Fire, 4-6 Grass, 7-9 Water, 0 my choice). Along with these rules, I also can’t save before a fight and just reload it if a Pokemon faints, that would make all of the rules pretty pointless. Over all the generations of the Pokemon games, I’ve always picked the fire starter. Before starting this challenge, I was actually hoping that I didn’t have to start with Cyndaquil as I finished Silver some years ago with Cyndaquil and I was hoping to experience a different start. Luckily, having an 8 at the end of my Trainer ID means that my first Pokemon will be the water starter, Totodile, which would be my prefered choice. Totodile and it’s evolutions learn a Dark and Ice move quite early on (level 13 for Bite and level 20/21 for Ice Fang). I named him Todd. Heading west from New Bark Town to Cherrygrove City without any pokeballs and the threat of losing before I really started didn’t sit well with me. I spent some time grinding Pidgeys and Rattatas and popping back to the Professor’s Lab to heal to get Todd up to around level 8 or so. Rage and Water Gun were learned and things were going well. After running errands for what seemed forever (although it has nothing on Kingdom Hearts II) for the Professor and Mr Pokemon I was finally able to get my hands on my first pokeballs. Before I could use any though, I had to beat my Rival.. Rob. Todd was able to crush Rob’s Chikorita easily. I was free to continue my journey and I figured that since I wasn’t actually able to catch any pokemon until now, I allowed myself to head back through those first 2 routes and try and catch the first pokemon from each. Through Route 29 once again towards Cherrygrove and I encountered a level 3 Pidgey. Picking up a Flying type early was a high priority as grass and bug types are used widely by trainers in the early game. Having a type advantage against them would make my challenge that bit easier. My only concern was that having Todd so high in comparison to this Pidgey meant that it would just be one shotted. Using Todd’s lowest damaging attack Rage, he was able to wittle it down enough to be caught. Welcome Perty to the team. The next Pokemon I encountered was a level 5 Kakuna along Route 30. I’m personally not keen on Bug/Poison type Pokemon, but at this stage, every Pokemon I can get is a bonus. With some low level tackling from Perty, Bumble joined the team, if only to be my Cut Pokemon until I find something better. 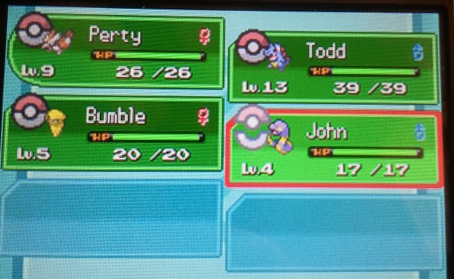 Route 31 threw up a level 3 Weedle as my first encounter which I caught anyway but I forgot to give it a nickname (I’m so used to just spamming B at that point), so he’s now sitting in the PC. Once reaching Violet City and healing up, I decided to have a quick peak into Route 32 to see what Pokemon I would find. The first encounter was an Ekans, another poison type, which wasn’t what I was after but I decided to try and catch it anyway. Ekans’ poison sting was particularly annoying whilst trying to catch it and showed me just how difficult this challenge may well be. Becoming poisonsed or burnt could be one of the easiest ways to lose a member of my team. Swapping Perty out after doing enough damage so Todd could soak some of the damage whilst I tried to catch it meant that John joined our team.